Please note the new 9:00 a.m. start time for the Tuesday rallies, to beat the summer heat. This week was capped off by the San Diego Pride Parade, with over 100,000 marchers and 240+ organizations, including the local Indivisible groups (see the San Diego Union-Tribune article). Making the SPLC’s “Hatewatch Headlines,” OC weekly reported that Issa spoke at the annual Federation for American Immigration Reform’s (FAIR) event in D.C. on June 28. 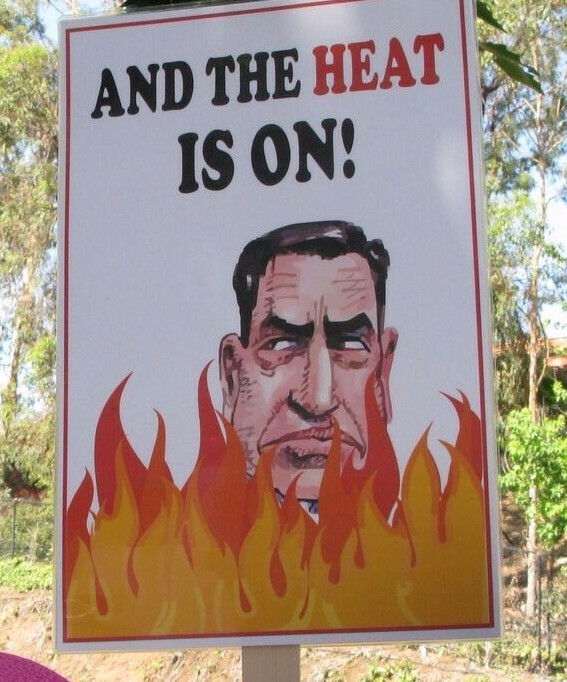 Hategroup FAIR has extensive ties to white nationalism, and has given Issa a 100% rating! In a rare moment of “Doing the Right Thing,” Issa was one of the House Republicans who helped defeat a bill amendment that would have prevented the Department of Defense from analyzing and addressing climate change. More coverage here. San Diego real estate investor and democrat Paul Kerr has entered the race for Issa’s House seat. Issa has raised $455k for his re-election campaign. As Pamela Hughes said in her Facebook post, "We've always known Issa would have deep resources. But we've got the fire and the momentum! There's a storm coming in 2018 and all Darrell's won't save him." Our Tuesday rally made the local news again, and we counted over 375 protesters! With our theme of "The Heat is On," we enjoyed being on the shady side of the street again. Thanks to Rachel Rott for leading the rally while Ellen's on a well-deserved vacation. See more photos here and here. At last Thursday's Encinitas Unity Issa Protest, protesters enjoyed the honking and support of the many drivers who go through the busy intersection of Encinitas Blvd. and El Camino at rush hour. See the photos. NOTE: Our Tuesday rallies are moving to 9 a.m. because of the heat. Palomar Unitarian Universalist Fellowship, 1600 Buena Vista Drive, Vista. Tuesday, July 18, 9:00 a.m.: Rally at Issa's Vista Office - "Happy Birthday, Medicare and Medicaid!" Bust out your health care signs and t-shirts. The timing couldn't be better for us to celebrate the success of Medicare and Medicaid, with the Senate poised to try again soon to pass a repeal of the ACA. We will be joined by folks from the California Alliance for Retired Americans, an organization that advocates with and for retired people, primarily around health care issues. Please help us welcome them! See here for more details and RSVP. At the corner of El Camino Real and Encinitas Blvd. For more information, check encinitasunity.com. Vista Civic Center/Morris B. Vance Community Room 200 Civic Center Dr, Vista, CA 92084. Together our neighbors, our community and our elected officials are working together to organize our neighbors and identify 75,000 voters that are ready to Flip the 49th! Breakfast and Logistics at 9:00 a.m., followed by rally and precinct walk at 10:00 a.m. For more details, click here, and RSVP here. Obviously, our eyes are still trained on the Senate and the fate of TrumpCare. McConnell is expected to delay the vote on the newly revised version while Senator McCain is out recovering from surgery. The CBO score on this latest version was expected tomorrow, but may also be postponed (per this Politico article). A bill weakening ozone regulations and one that creates harsh criminal penalties for using the painkiller fentanyl will likely be voted on in the House this week. And, the FCC is still taking public comment on the new rules that would dismantle net neutrality. Send a comment to the FCC in support of net neutrality (the group of laws that make it illegal for internet carriers to show different information to people who pay more.) Keep the internet open! FCC is taking public comment right now! Here’s how to comment. Also, keep an eye out for the CBO score on the revised TrumpCare bill, and keep up the calls to your Senators. You can support the family of Jonathan Coronel (unarmed 24-year-old man killed by police in Vista) by donating to their GoFundMe.